Can You Find The Four Goldfinches? Most of this month has been rather hot for Central Virginia, but the birds and butterflies don't seem to mind at all. 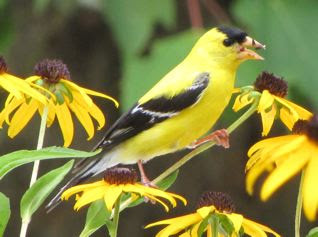 Our black-eyed susan flowers on the deck are now seeding and attracting goldfinches. Can you see four (4) goldfinches in the above photo? One of the males is rather hidden. There are two bright yellow males and two females that are a bit more drab, but nonetheless beautiful as you can see from the photo to the left. 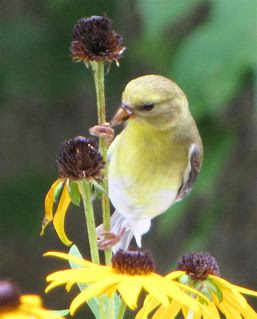 However, I know that it's the males that really makes us notice American Goldfinches. The bright color is what makes the female notice also, since females select their mates based on the brightness of the male plumage, according to research done by Keith Tarvin and his research team at Oberlin College in Ohio. The carotenoid pigments that create the bright color (the same factors that make carrots orange) are acquired from their diet. So, when females pick the brightest male to mate with, they're getting an expert forager / provider for their offspring. When we lived in Alabama, we had the goldfinches in the winter. The males look pretty much like the females in the winter with a deeper black. When they begin to get some of those bright yellow feathers in, they were ready to migrate north, so we didn't get to enjoy them in full breeding colors. Here in Virginia we enjoy seeing the brilliant color and to know they are also nesting here. They use down from the thistle plant to line their nests, so they nest much later than most birds since thistles don't bloom till July. Maybe they take the time to wait and see which males will be the brightest also as their breeding colors become more and more bold. We've had a lot of butterflies this year and I've photographed a few new ones. I'll share more about that in the next newsletter. 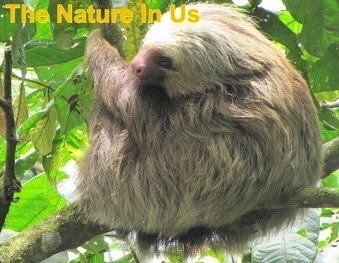 For more critter and garden photos of our acre in the woods, visit my Photo Gallery. Have a blessed month of August and take time every day to notice something amazing in God's Creation. It always has a lesson to teach us if we ponder what we see.